2016 Land Rover Range Rover Sport HSE Td6. Are diesels better than gasoline engines? A significant segment of the consumer market thinks so, especially in Europe, where such engines compose nearly half the vehicles purchased. In the US, diesels have had difficulty gaining acceptance, with heavy-duty pickup trucks and German luxury cars among those offering them. But with Audi currently snagged in the Volkswagen diesel scandal mess, a negative light has been cast on these engines, with some insisting that they’re far dirtier than what manufacturers say they are. Fortunately, not all manufacturers are being dissuaded by such negativity. Chevrolet now supplies a turbo diesel for its popular midsize pickup trucks, Nissan recently rolled out a Cummins diesel for its all-new Titan XD full-size pickup, and Jaguar Land Rover is shipping its own diesel-powered models across the pond. In any case, every engine (diesel and gasoline) must pass more rigorous EPA oversight, so such concerns should simply be dismissed. One such engine found its way under the hood of a 2016 Land Rover Range Rover Sport HSE Td6 model. The “td” appellation stands for “turbo-diesel” and the “6” represents the number of cylinders utilized. Specifically, what you have here is a 3.0-liter, turbo-diesel V-6 engine making 254 horsepower and a robust 443 foot-pounds of torque. The engine is also available in the large Range Rover HSE model. An 8-speed automatic transmission sends power to all four wheels. The timely introduction of the turbo-diesel demonstrates resolve on Jaguar Land Rover’s part to move forward regardless of the problems of its competitors. JLR is a minuscule entity when compared to the Volkswagen Group, although as part of the Tata Group it has considerable resources on hand. Lower gas prices may have some people thinking less about fuel economy, but for those that put a premium on efficiency, the turbo-diesel should please them. That’s due chiefly to a fuel economy rating of 22 mpg in the city and 29 mpg on the highway for a 32 percent improvement over the comparable gasoline engine. Yes, diesel fuel comes at a premium price, but there is another factor to consider here: maintenance is simpler and diesel engines last longer. 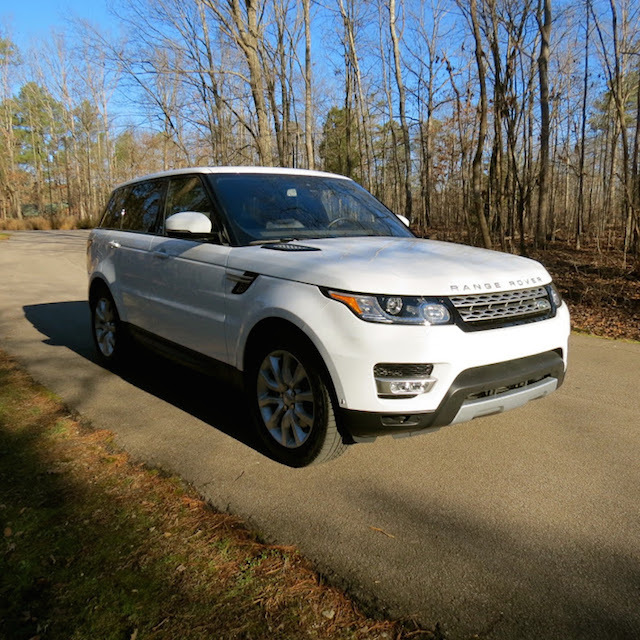 Place those two facts under the hood and you have a compelling reason for considering the Range Rover Sport. In any case, diesel fuel prices are now lower than premium gasoline in most areas, so don’t allow cost to deter you. Notably, the diesel-equipped Sport model is no laggard on the road, traveling from 0 to 60 mph in 7.1 seconds or just two-tenths of a second slower than the equivalent gas-powered model. The all-important fuel range is now up to 658 miles. Now in its third model year, the current iteration of the Range Rover Sport continues to impress. Although this model is most certainly an SUV, it behaves very much like a driver’s car with involved steering and precise handling at the ready. What it doesn’t have is the attendant diesel clatter, what typically is more pronounced on cold days or in just the type of weather I experienced for much of the week I had it. Only during hard acceleration, or if you’re standing outside of the SUV as it idles will you hear the unmistakable engine murmur. I considered it more of a reassurance than an annoyance — reassuring as I knew that improved fuel efficiency and vigorous torque awaited me. Stomp the accelerator and the diesel-powered Range Rover seems slightly slower than its gas-powered counterpart, but that sluggishness quickly dissipates as the turbo spools and full power is at the ready. Indeed, had I squared this model off with the equivalent gas-powered version, I imagine that it would have immediately fallen behind, before closing the gap significantly before losing by a whisker. Horsepower and torque are synonymous, the latter providing passing power or the second hit of energy you experience when zooming down the highway. In the Range Rover Sport it doesn’t provide an additional towing benefit, as all models have a 7,716-pound towing capacity. Customarily, when I present a model review, performance is listed toward the end, not at the beginning. But the story here is the turbo-diesel and all the acclaim it deserves. Nevertheless, we’ll take a closer look at the model at hand, inside and out. Range Rovers offer a commanding presence and are the cream on top of the Land Rover pie. Those models not wearing the secondary Range Rover models are in the more mainstream “Discovery” series, but the platforms, powertrains and other essential components are the same. Consider your Discovery line the equivalent of your play clothes and Range Rover as your formal accouterment. Regardless, what you have here is a solid mass of SUV usefulness, a polished model with a mien suitable for your country club visits. The front fascia is marked by the narrowest of an upper grille with wraparound headlamps flanking same. The lower grille opening is much larger and is accented with a skid plate. At the far corners of the bumper are large embrasures housing the fog lamps. A clamshell hood and a tall windshield complete the frontal presentation. From the sides, the Range Rover Sport is marked by a large greenhouse with tall pillars. A powerful belt line, body sculpting, and character lines are present along this SUV’s profile. Large wheel wheels, alloy wheels, side vents and rocker panel trim round out the look. The Sport’s rear fascia has oversized, wraparound combination lamps, a prodigious spoiler, dual exhaust ports, and a skid plate. As elegant as the Range Rover Sport is, Land Rover went with a fairly simple or straightforward interior, marked by an instrument panel featuring a two-cowl speedometer and tachometer display. In the center of it all is a digital driver’s information center with the expected readouts. It seems as if leather is everywhere — wrapping the thick steering column surrounding the instrument panel, covering the dash, on door inlays, storage compartments and, of course, across the seats. Aluminum trim and wood embellishments are also present. The center stack is orderly and uncluttered, amplified by a large color display followed by large knobs for the audio system. Splitting the front seats is the transmission stick and two cup holders as well as the four-wheel drive controller and the attendant switches. Activate the controller and you’re ready to take on most any on- or off-road sojourn — ice, rain, snow, sand, mud, rocks — you name it. Most people who buy Range Rovers aren’t about to venture off road, but just having the security you can is most assured. If you’re wondering what this model will cost you, it comes in at a base $71,450 price. As is common to my test models, this one offers more than $12,000 in upgrades, bringing its final price to $84,610, including destination charge. A front climate comfort and visibility package added $2,620, bringing in 16-way power front seats, a heated steering wheel, adaptive Xenon headlights, blind spot monitoring, a vehicle sensing system and rear traffic alert. For $2,900 you get the driver assistance package, what adds lane departure warning and traffic sign recognition — drive past any speed limit sign and that number registers on the instrument panel. You also get parking assist, a head-up display and an all-around camera. A $1,750 extra duty package, a $900 tow package, an 825-watt Meridian audio system ($1,850) and adaptive cruise control with queue assist $1,295) were among the other options present. If the add-ons seem a bit over the top, Range Rover may simply be more than what you can afford. Fortunately, the Land Rover line begins with SUVs priced from under $40,000 and that means something that might be otherwise unattainable can be had within the range of first-time luxury vehicle buyers.